General Phillip Sheridan may have graduated at the bottom third of his class at West Point, but he left a strong legacy during the Civil War. For General Philiip Sheridan, war was a tonic. The trajectory of Sheridan’s career traced back to his childhood in Somerset. All things military were the rage among the boys in that Ohio town. Next to Christmas, the Fourth of July was the most important day of the year. Every year, Somerset’s one Revolutionary War veteran would be trotted out to greet the crowd. As the town’s cannon barked its salute and the crowd cheered wildly, a young Sheridan would gawk at the old warrior. 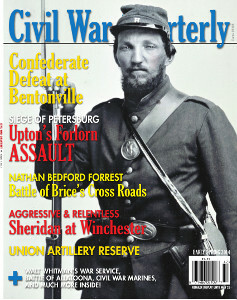 Inside this early spring issue of Civil War Quarterly, you’ll read all about Sheridan’s orders from Ulysses S. Grant to wrest control of the Shenandoah Valley from the Confederates. As you’ll soon discover, “Little Phil” Sheridan initiated a series of battles that would go far in determining the outcome of the war. General John Bell Hood aimed a dagger at Sherman’s supply line in the tiny Georgia railroad town of Allatoona Station. Battlefield photographers managed to make a lasting record of the war’s conflicts, even though the craft of photography was still in its infancy. Created by Major General George McClellan, the Union Army of the Potomac’s artillery reserve used massed cannons to provide concentrated and sustained firepower. With William T. Sherman’s notorious “bummers” closing fast after their March to the Sea, a ragtag Confederate army prepared to make its last stand in the bottomlands around Bentonville, North Carolina. With a bloody stalemate looming in the Virginia woods, a young Union colonel suggested a risky new maneuver to break the Confederate line. From an inauspicious start to the First Battle of Bull Run, the United States Marine Corps took part in several significant battles, on land and at sea, during the Civil War. While he moved into Georgia, Union General William Sherman wanted a covering force in Mississippi to attack fearsome Confederate raider Nathan Bedford Forrest. At Brice’s Cross Roads, he would get his wish. What do you think of General Sheridan’s legacy in the Battle of Winchester? Let us know what you think about this and other stories from the most recent Civil War Quarterly issue in the comments below. Tags Army of the Potomac, Battle of Bull Run, Confederacy, general john bell hood, General Philip Henry Sheridan, mule shoe, nathan bedford forrest, Shenandoah Valley, Ulysses S. Grant, Union Army, William T. Sherman.